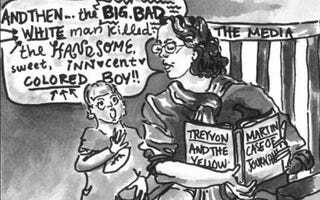 Crazy Talk: Worst Trayvon Martin Cartoon? Cartoonist Stephanie Eisner shared her take on the Trayvon Martin killing in the University of Texas at Austin's paper, the Daily Texan. If we're correct in interpreting the sentiment about the story that underlies the "humor," it seems to be her concern that the media are spinning the story in a way that makes white people look bad and black people look good. Because, you know, the media are always doing that … Oh, wait … maybe not. Ever. Anyway, in the cartoon, "THE MEDIA" provide a fairy-tale-inspired retelling of the events that led to Martin's death, in which a "BIG BAD WHITE" man killed a "handsome, sweet, innocent COLORED" boy. Putting aside the facts that no one says "colored" anymore and that Trayvon Martin's killer doesn't actually identify as white, we're perplexed about why that would be Eisner's main gripe about a story about an unarmed teenager of any race being killed. A controversial editorial cartoon on the Trayvon Martin shooting was published Tuesday on the Opinion page of The Daily Texan. The Daily Texan Editorial Board recognizes the sensitive nature of the cartoon's subject matter. That makes sense. Eisner, of course, is totally entitled to her opinion. And she's entitled to be more upset about media coverage of this tragedy than she is about Martin's death and the deaths of so many other unarmed black men. We just hope UT has a good music program so that someone there can play her the world's saddest song on the world's smallest violin.